Since Rosenblatt Stadium closed in 2010 and the New but not necessarily improved stadium opens in 2011,the Barons will possibly attend the College World Series in 2013. There IS a chance that we will go in 2012. In 2010 the West Bay Barons travelled to Omaha Nebraska and attended 5 College World Series games held for the last time at Rosenblatt Stadium. Players making the trip were Danny Baldocchi, Tommy Barri, Brian Benavides, Clay Bloszies, Devin Bradley, Jeff Fox, Andrew Garcia, Julian Garcia, JJ Kunkel, Michael McEntee, Gabe Morse, Ryan Murphy, Nick Nussbaum, Chris Redburn, Jack Ritzo as well as Coaches Edmunds, Thomas and Chanteloup. Dads who joined the trip were: Vince Bradley, Jeff Kunkel, Jim Baldocchi, Wayne Redburn and Gary McEntee. The Barons played in a 48 team tournament and finished with a 3-3 overall record. Clay Bloszies and Brian Benavides, both from International High School in San Francisco had their own unique perspective as they joined their High School Coach Anthony Thomas in the team’s journey to Omaha. 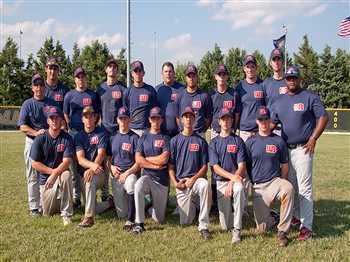 The Peninsula Connie Mack's West Bay Barons played in one of the most competitive summer league programs in California. Connie Mack Baseball features future collegiate players and provided an excellent experience for this Club, while using wood bats 90% of the time versus metal. Just going to the tournament was exciting enough, but what made this even more special was that the tournament was being held at the same time as the College World Series. After playing in hot humid conditions, Bloszies and Benevides along with their teammates and coaches - were able to attend World Series games. Watching baseball being played at its highest amateur level motivated Clay Bloszies - Brian Benevides and their teammates to really focus on their game. Many of the Barons will have the opportunity next year to impress college coaches and attend a school where they will be able to play. The player’s commitment and love for the game on the West Bay Barons will take them a long way in their future endeavors.